Infor, the vendor’s original BI product, was initially developed by MIS long before 2002. Several acquired products were combined into the Infor BI suite, which includes components for dashboards, reporting, OLAP analysis, planning and financial consolidation. With the acquisition of BIRST in 2017, Infor’s BI portfolio has been enhanced with a cloud-based BI platform for formatted and ad hoc reporting, dashboarding and analysis. BIRST will be the strategic BI and analytics product in Infor’s business software portfolio. Since the acquisition, Infor has changed its go-to-market and product positioning strategy significantly, splitting its portfolio into BI and CPM products. BIRST is now positioned to serve BI usage scenarios and Infor EPM – Infor’s existing BI and CPM product – to serve CPM usage scenarios. BIRST will be Infor’s new cloud-based flagship platform for BI and analysis/data discovery. The product plays a significant role in Infor’s BI and cloud strategy. Access to Infor’s operational systems such as ERP and CRM, as well as to Infor d/EPM’s underlying OLAP database is provided. One of BIRST’s particular strengths is its access to many different data sources and their combination in the product’s integrated semantic layer, which will be exposed to users. Furthermore, the solution will be packaged with Infor’s CloudSuite products, which consist of operational systems for different verticals. 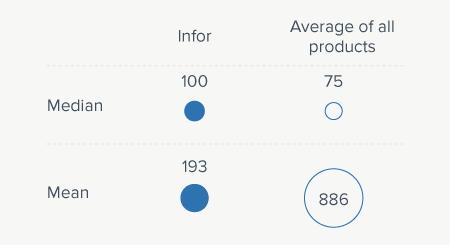 In Infor’s overall portfolio, Infor d/EPM is positioned for CPM and planning, whereas the BIRST product is positioned for BI and reporting. Interestingly, and in contrast to the vendor’s competition, Infor seems to reject the market trend of providing a single platform for BI and CPM for better, integrated decision-making. Instead, BI and CPM are separated into two different products. The future will tell whether superior connectivity from BIRST to Infor d/EPM will compensate for this. Infor BI is a platform for building tailored reporting, analysis and planning applications. Besides its main use cases (standard/enterprise reporting, ad hoc query and budgeting/planning) the product is also frequently used for basic data analysis (typically OLAP). 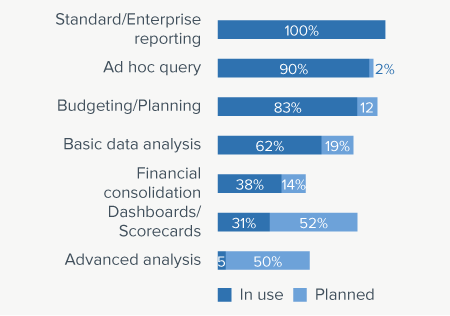 52 percent of respondents plan to use Infor BI for dashboards/scorecards and 50 percent for advanced analysis in the future. Infor targets mid-sized companies and large corporations across all industries. 48 percent of our sample of Infor BI customers come from mid-sized companies (100-2,500 employees) and 48 percent from large companies (with more than 2,500 employees) with a median of 100 users. The mean of 193 users indicates there are also some significantly larger implementations. Infor BI is geared to business power users with broad functionality for various BI and CPM tasks. Typical tasks carried out with Infor BI by business power users include viewing, navigating and exploring data: testament to the feature-richness of the product. 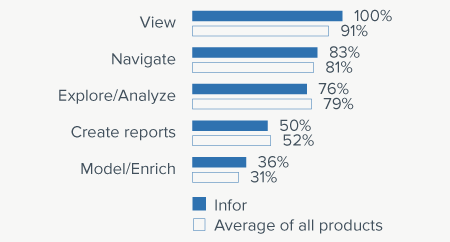 BARC’s Vendor Performance Summary contains an overview of The BI Survey results based on feedback from Infor BI users, accompanied by expert analyst commentary.